Carrot Apple Juice with Fresh Basil was posted on September 15th, 2011 and is filed under Dairy Free, Drinks & Smoothies, Gluten Free, Recipes, Vegan. This entry has 17 comments. You can follow any responses through the RSS 2.0 Comment Feed. I love carrots. All kinds. Crunchy orange ones from the garden. Diamond carats that glitter a mile away. Yup. All kinds of carrots are good in my books. My sister loves carrots too (the sparkly kind too…we’re so similar in our tastes) and she’s always buying carrot juice. When we travel, which we’re constantly doing, she’s always salivating over the idea of carrot juice. I think she’s cute. So we both end up buying the big (I mean BIG) container of juice to share. And then we realize it’s not so cute when our skin turns orange. Darling, right? Haha, actually…we just giggle over it…because we just know a couple handsome Oompa Loompas out there will fall head over heels over us. Maybe even give us some sparkly carats? Juice everything up in your juicer, except lemon. Stir in the lemon at the end. Pour into two glasses and garnish with fresh basil. 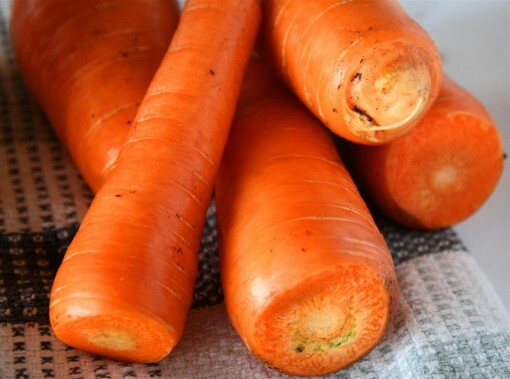 Use nice organic carrots for juicing! The skin is thin and that’s where a lot of the chemicals/pesticides of non-organic carrots are stored. If using commercial carrots, you may want to peel them. Even a little “organic” dirt on them…fresh from our garden. Mmmmm…nothing like growing your own! Today: We’re shopping all day long. Groceries, clothes shopping, and bazillion other things! We have an enormous trip coming up with the family band (I’ll tell you about it soon!) so there’s so much to think about and get before we leave. Today’s workout will be shopping. That’s okay, right? After a day of walking a few miles worth of grocery stores, malls, and sidewalks I think it totally qualifies. In other news. I NEED YOUR HELP! My next post will be a roundup of great, healthy after-school snacks and I would so loooooove YOUR assistance! I want all your yummy ideas…comment below, post your favourite snack on my new Facebook page, or tweet me on Twitter! Food Bloggers: You can contribute too…just send me a link to one of your loveliest snacks/treats that would be great for an after-school snack! So come on, let me know all your favourite healthy snacks? Wow, I would have never thought of this combo but it sounds good! I never liked carrot juice. It is too sweet for my taste. 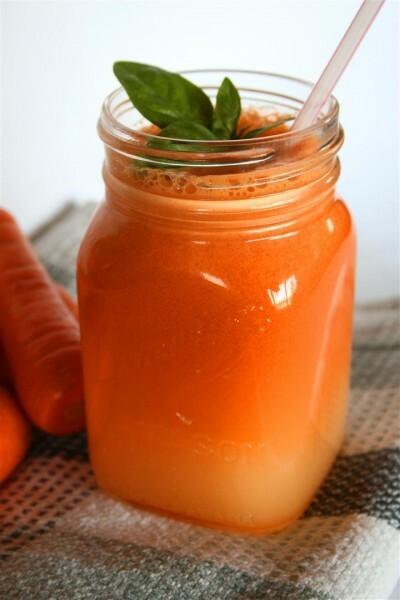 I have actually never tried carrot juice, but this does look refreshing as well as healthy. Funny about the orange skin due to overload! Wow! Yum and yum! My famiy will LOVE this. ANd I Love carrot and apple juice myself. with fresh basil-> even more! It’s just an awesome idea, awesome! I love carrots, too, but have never found a carrot juice I loved. I’ll try this one this weekend though. Organic carrots are pretty cheap here, so I’d love to use them more for my juices. My son loves carrots!I have to make hi drink for him…it sounds delicious! Apples and carrots sound like a great combination for a juice. I think I’d like that much more than just carrot juice! I like that mix. The basil makes it special. That looks so colorful and it will benefit those with gallstones. I want that refreshing fresh carrot apple juice. I really need a juicer…. I love carrot juice with apple juice but I have never tried it with ginger and basil before. I need to get myself a juicer as well. Thanks for the inspiration and wonderful recipe!! I really love the carrots. I always eat carrots directly without the need in juice or other. If I want to use it as a juice, I make it, but I rarely do that. I liked carrots since both my eyes detected the cylinder, I immediately consume carrots, the result both of my eyes cylinder decreases. Since then, I really liked carrots. Looks great but be somewhat wary! Both apples and carrots contain a lot of natural sweeteners for all you diabetics out there.